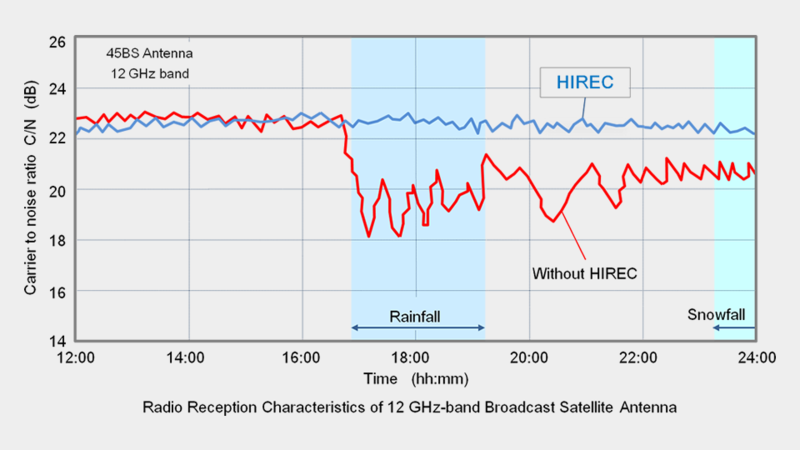 Radio receptions of 12G Hz-band broadcast satellite antennas at 5 mm/h rainfall were measured in the field. The aperture diameter of the antenna was 450 mm. No deterioration in Carrier To Noise Ratio C/N was shown during and after rainfall. No water film was formed on the surface of the antenna. Radio reception deteriorated during and after the rainfall. The rain caused to lower C/N of 3-4 dB by water film attenuation. Even after the rain, the deterioration in C/N continued for a while due to remaining water film. The deterioration continued for 19 hours after the rain cleared, which was caused by the remaining water film. The super water repellent paint, HIREC, is an effective countermeasure for rain attenuation in antennas.